Has it been a month already? Waow! That was a much needed break! 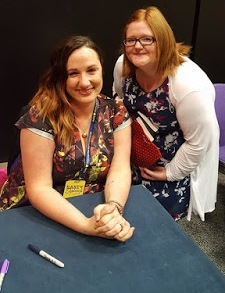 July is finally here and I am EXCITED as RARE Edinburgh is happening this weekend and I am so many amazing authors including Jennifer L. Armentrout, Abbi Glines, Anna Todd AND Samantha Young! The best part is I am spending the weekend with my partner and we both for a fact deserve this little time out to relax and enjoy each others company. Read on to see what I'm planning at the end of July and also what few little changes I have in store. After taking a month of blogging I am feeling inspired and motivated to get back into the swing of things and have been a busy bee organising different upcoming features to keep me on my toes which will enable me to continue blogging and looking to the future. I am hosting another week dedicated to Christmas in July and am still seeking authors/bloggers and readers to take part in mini Q&A's regarding Christmas! Instead of hosting different authors each day I have decided to host several authors with mini Q&A's so there is a little something for everyone. There are some changes happening an that included no blogging on a Saturdays! I'm hoping to spend Saturdays catching up and reading all my favourite blogs so I don't fall behind. So.. July! Although I am getting into the festive spirit for Christmas in July I am definitely crossing my fingers for some sunshine! How have you been this month? Have you been reading anything exciting? Let me know in the comments below! Hope July brings happiness to you!